at Cozy Dell (mile 68( on cancellation. For the second year in a row, the Coyote Two Moon 100 in Ojai, CA was dealt extreme weather. Unlike last year, though, the weather won this time. 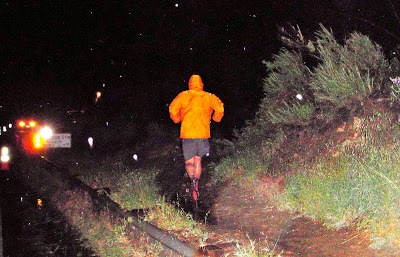 Heavy wind and rain on the valley floors and heavy wind and snow on the frequently travelled Nordhoff ridge caused the race director to stop the race for safety reasons shortly after midnight Saturday night (very early Sunday morning). In the 100 mile race, Jeff Browning, Karl Meltzer and Justin Angle were in between miles 68 and 75 when word of cancellation came through. 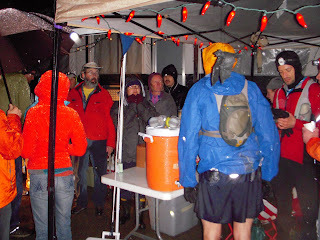 Ty Draney, Jared Campbell, and Andy Jones-Wilkins had just entered the Cozy Dell aid station at mile 68. As conditions deteriorated and the night went on, the race director took stock, allowing fewer and fewer runners to continue the race unless they were well-prepared for the wet, cold, and snowy weather, eventually cancelling altogether. Aid station captains and communication staff then began scrambling to account for all runners. Rain is still falling heavily in the region and is expected to continue doing so through the rest of the weekend, which may affect to some degree Sunday's running of the LA Marathon. Chris made the right call and the volunteers did a spectacular job working to make sure all were safe. It was nasty up there, so nasty that if a runner had difficulty (not uncommon in the late miles) and was slowed it could have been deadly. That's life...playin' in the outdoors! Thanks for the first hand account. Conditions were bad just hanging out at Cozy Dell, and it definitely seemed like a smart move based on the condition of a lot of runners coming through that I saw. Nice work. You were moving along nicely. I echo Justin's comment. The conditions were brutal and they made the right call. I feel horrible for the event organizer, as up to the end the support and overall race were amazing. Best support i've ever seen with amazing food and drinks. I just feel so bad for them since they did everything right only to get hammered by the weather. I'm looking forward to a race report from Chris to see how it all went down. i really hope everyone made it down safely.